Computational photography is a wide concept with many possible interpretations and directions. I couldn’t choose one project for the course, so I made two, and showed them with my classmates at Pixelache in Augusta Gallery. 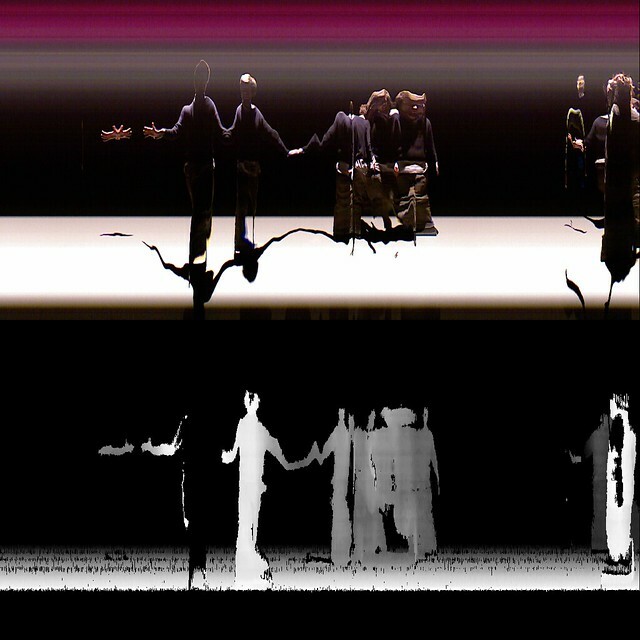 One project was an extension of some earlier computational photography experiments with Flash+webcam, called PaintCam. The other was a collaboration with Timo Wright called Slithering. We shot two dance scenes, one with Anna Mustonen and the other with Lucía Merlo, Charlotte Lovera, Elise Giordano and myself. Thanks to Lume studio for helping us set up the lights. We shot HD video with the Canon 5D Mark III. 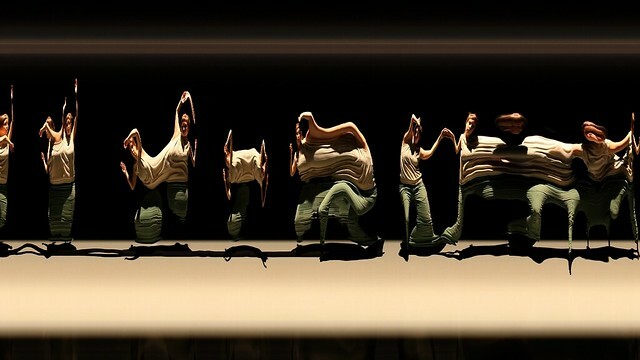 We thought that it would be important for the dancers to have a preview image to see how different movements would affect the final image, so I made a Processing sketch that would approximate the aspect ratio of the 5D’s output. We used Kinect for the preview, with the idea that the depth data might interesting to use somehow in the final. The slitscan video (three dimensions shuffled) ended up interesting enough that I left the depth data for future experiments. What could four shuffled dimensions look like? 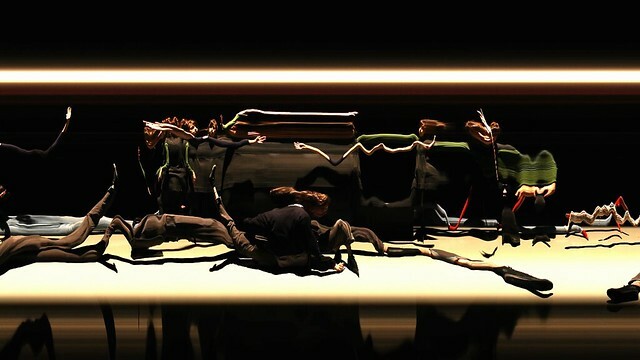 Slithering is a alternative dance documentation where the dancer dances and reacts with the Slithering program. The program scans from a camera a one pixel wide segment and orders these segments to become one long picture in time. In this project the dancer has to find a completely new kind of movement, if she wants to control the visual end result. 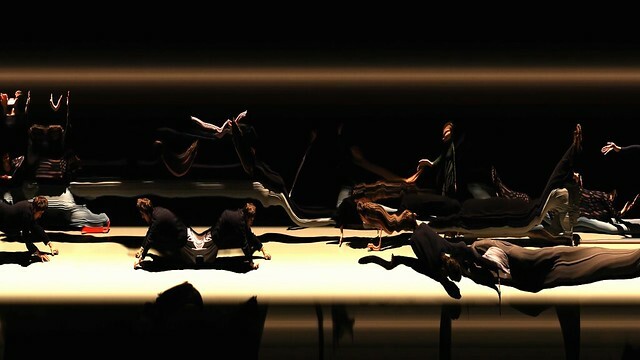 It also changes the documentation of dance in time and space to now happen only in time. What is dance minus space? Redimensionator wasn’t written until after the dances were filmed. We had the still-image preview while dancing, but had no idea what it would look like in Redimensionated video form. 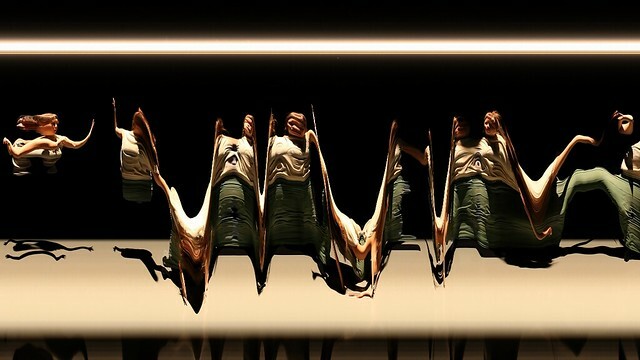 In the future, it would be fun to choreograph a dance piece or music video with the output in mind. Putting some planning into costumes, props, and choreography could make for very interesting output. This entry was posted in Audio-Visual and tagged Computational Photography, dance, Forrest Oliphant, pixelache, slitscan, Timo Wright, video. Bookmark the permalink.